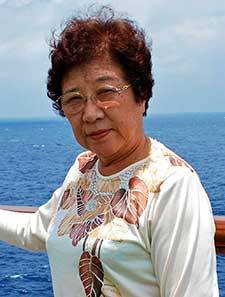 “I was born in Hiroshima in 1934, and when I was ten years old (Grade 5 in Primary School) I was evacuated to the remote island where my father was originally from. Both of my parents were teachers, however my mother left her job for the sake of me and my older brother and moved with us to the island. August 5 was my father’s 42nd birthday, and so my mother had travelled to Hiroshima to have a small celebration with him. My father never returned after leaving for work the next morning, August 6. My mother was blown away when the bomb was dropped as she was mobilized for labor service that morning. She was buried under a large building with a serious injury to her head and burns to her arms. She stayed outside in that state for around a week and walked through the city searching through piles of corpses to find my father. When she reached her physical limits she returned to the island, but at the same time as returning home she collapsed. “For around the next eight months, my mother was seemingly endlessly in the hospital. My brother and I also stayed overnight there, and helped to treat the over one hundred people who arrived every day. They were carried on stretchers from Hiroshima in terrible conditions. We did as much as we could to help my mother, including feeding her fresh tomatoes and cucumbers. Finally my mother was able to return to her teaching position, and despite suffering from radiation disease continued to dedicate her life to children for the next 16 years until her difficult life ended when she was 52 years old.